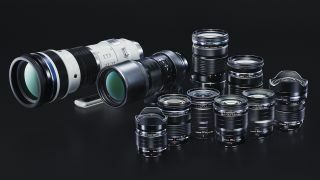 Hot on the heels of announcing the Olympus OM-D E-M1X, the mirrorless manufacturer has published its lens roadmap revealing eight new optics on the horizon – among them six Pro lenses to support the launch of its professional flagship camera. Also on the list is the already announced M.Zuiko 150-400mm f/4.5 TC1.25x IS Pro, an impressive super telephoto lens with built-in converter that gives it a 1000mm equivalent focal range. The ratio of Pro to standard lenses being announced, along with the positioning of the E-M1X, tells you that Olympus is aiming squarely at professionals. As noted by Canon's CEO, smartphones are eroding the digital camera market and Canon is responding by shifting focus to corporate customers. Olympus, by throwing its weight behind the pro-oriented E-M1X and all this new glass, is likewise positioning Micro Four Thirds as a professional system – not just a cheaper, smaller format. With Panasonic seem to be sidelining Micro Four Thirds in favor of the soon-to-be-launched full-frame Panasonic S1 and S1R, the future of the MFT format may firmly be in Olympus' hands.